How many of you remember Hobie Shepp and the Cowtown Wranglers? They performed at the Concordia Street Fair during the late 1940s and early 1950s. Hobart Schelp (aka. Hobie Shepp) and his younger brother Raymond grew up in the Concordia area. Hobie formed a country music group (back then we called it 'hillbilly' music) known as the Cowtown Wranglers. Hobart was born Jun 18, 1916 on a farm in Saline Co., MO northwest of Sweet Springs, son of Henry F. and Bertha Schelp. Sometime before 1930, the family moved to a farm north of Concordia, east of Highway 23 and just south of Davis Creek. Hobart became quite proficient with the fiddle so he and Raymond performed regularly at various events in the area. One of these early events was a Concordia Lions Club talent show, where they were part of George “Red” Hewitt's band. (See my posting at Red’s Musical Talent). After leaving Concordia, they performed on radio (St. Joseph originally) until they split into two different groups. Hobie formed the Cowtown Wranglers which became popular entertainers in the Kansas City area with a radio show on WHB. The group returned to Concordia a number of times for Street Fair performances. If you google “hobie shepp” on the Internet, you will find an interesting YouTube video at Hobie Shepp Presents " Celebrating 65 Years Of Entertainment" 1995. There are several comments to the video that provide more information about Hobart and Raymond's careers, posted by their descendents. After some years in the KC area, Hobie built a bar in the Lake of the Ozarks area called “Fiddlin Inn”. After that, he built a square dance hall called “The Bushwhacker”. The Cowtown Wranglers reached the pinnacle of their fame in a 1950s movie produced by Robert Altman, called “Corn's-a-Poppin”. Hobie and his group are featured prominently in the movie with some original songs by Hobie. Recently the film has become a cult favorite at various film festivals, having been restored by the Northwest Chicago Film Society. You can find a short trailer for the movie at http://www.imdb.com/video/screenplay/vi2579431705?ref_=ttvi_vi_imdb_1 or the full movie at [https://www.youtube.com/watch?v=QzejNljcss0. [Note. Full movie is poor quality because it was captured from a TV broadcast.] Also, if you search online for “Corn's-a-Poppin”, you will find some interesting reviews. 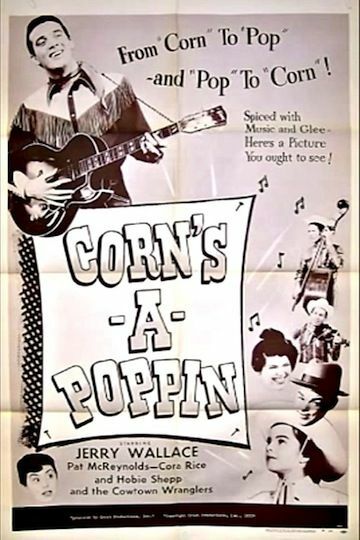 If you have looked at the old movie Corn's-A-Poppin' or read the reviews, you will soon realize that it is not one that would win an Oscar or Golden Globe award. The following is a one of the reviews. One of the most detailed reviews can be found at http://www.northwestchicagofilmsociety.org/2011/10/09/peants-for-popcorn-a-tentative-history-of-corns-a-poppin/. Robert Altman, who was from KC, a graduate of Wentworth Military Academy in Lexington and a five-time nominee of the Academy Award for Best Director for producing a number of movies such as Mash, was not proud of this early effort. [Altman disowned this film and requested that any surviving copies be destroyed.] He also produced a large number of familiar TV series and programs. This movie was the type of low-budget, B-grade movies that would be shown in earlier years as a second show before the main attraction. It is one of those 'campy' movies that are revived for film festivals by old-film buffs. Incidentally, Thaddeus Pinwhistle (the head of Pinwhistle Popcorn company in the film) is a tongue-in-cheek characterization of Kansas Citian Charles T. Manley, a true innovator who developed the electrical popper seen in movie theaters. Hobie continued to visit Concordia in later years. My sister remembers him performing for the old folks at the Good Shepherd Home when his mother was living there.